A full moon and the first long-distance test of the new HOTWOOD Western Late Models at Stockton Speedway disproved fears on both counts as the first leg of the three-race Tri-Holiday Series came off in fine fashion on the quarter-mile paved oval. 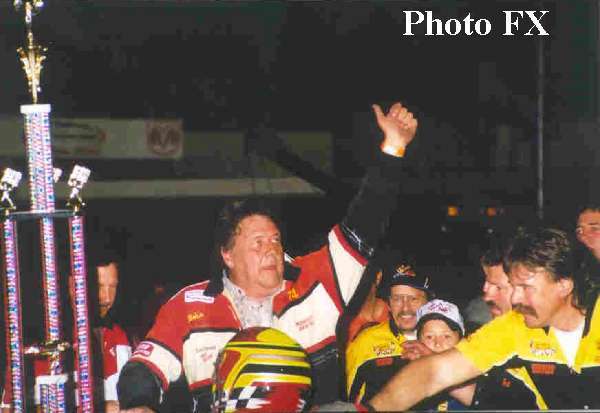 Although eight yellows and two reds slowed the action on the 100-lap affair, it was standard fun and games at the fabled track, for fans and drivers alike, as veteran Harry Belletto of Modesto took center stage with a sweep of the nights events. The 59-year old Belletto, in his 34th season at Stockton, rushed into the pits from personal business with scant minutes to spare before his call for time trials. He donned his uniform over expensive street clothes and promptly snapped a new track record of 14.114, and promised his crew with a grin to wear the same clothes next week. After coming back to win the trophy dash over the divisions only, and quickly improving gal, Melissa Davis of Santa Rosa, Belletto lined up 8th on the 19-car feature grid for the 100-battle. Harry’s youngest son Jeff, also of Modesto, jumped to the early lead from his pole position start with incoming point leader Dave Byrd of San Jose coming to 4th on lap-three and H-Belletto sliding to 5th on lap-6. Two minor yellows slowed the action before one on lap-27 shifted the balance at the front when Tracy Bolin of Valley Springs was accused by officials for involvement in the spin of the leader J-Belletto in turn-4. Bolin beat the field to the yellow but was sent to the rear to join Belletto on the restart. 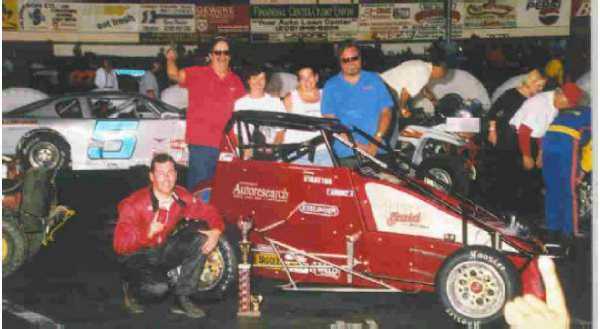 Problems once again haunted J-Belletto as he and Pete Anderson, Jr. of Stockton got togeather in turn-1 allowing Byrd to grab the lead at the yellow that was followed by a red as the track clean-up crew went into overdrive. On the restart it was Byrd, H-Belletto, Mark Welch of Orangevale, Eddie Laws of Citrus Heights, and the well known "other" driver, Joe Hylton of Manteca, with Belletto gaining the lead on lap-39. Four more minor yellows fell on the field as the race progressed to the 94th circuit and a red flag as Chris Monez of Lodi blew a motor off turn-2 and took a hard shot into the outside wall. Ten cars remained to blast to the checkered with Belletto in front over Byrd, Laws, Welch, and the "other" driver" Hylton in his new ride that is quickly coming togeather as a competitive machine for the popular and always smiling Manteca driver. Pure Stock action saw Chad Holman of Stockton win his second season feature, stop the three race win streak of Guy Guibor of Manteca, and give his dad David a 48th birthday gift all in one. Holman started 6th on the 20-car field with Joey Stearns of Stockton taking the early lead. Ron McCaul of Manteca took the point on lap-15, but received a black flag as his car starting smoking with the incoming point leader Guibor right behind. Guibor took the lead on lap-19 as Stearns obeyed the flag leaving Holman second in line. Holman picked his spot and time, and took the point on lap-24. Unchallenged from that point he took the checkered first over Guibor, fast time and dash winner Michael Wendt of Lodi, McCaul, and Cindy Freitas of Lodi, who once again finished with a strong performance in the top five. Guibor maintains a 26-point lead over Holman, with Johnny Bird of Stockton running third. David Ball of Stockton leads in the division’s B-Main title run by a strong 40-point margin over Dustin Himes of Stockton. STOCKTON, CA., MAY 25: Danny Stratton, 63x, awaited opportunity and charged to the lead and win in the co-sanctioned Bay Cities Racing Association/United States Auto Club Midget Thunder event at the Stockton "99" Speedway. Driving the Pinkston Esslinger/Edmunds, Stratton started the 30-lap feature in the tenth position and worked his way to second over the first 24 laps on the quarter-mile paved oval before charging under early leader Marc DeBeaumont for the lead. DeBeaumont led off the feature from the pole with Travis Johnson, Glenn Carson and Rob Russell in close pursuit. Jerome Rodela brought out the first caution flag on the third lap when he spun in turn-4. Stratton began moving forward, taking seventh on the fifth circuit. On the seventh lap he passed Shane Scully for sixth, a pass that may have saved him from disaster - because, on the next lap Scully and Thomas Meseraull made contact in turn-4, spinning in front of the closely bunched pack. During the melee of drivers attempting to avoid the spun cars, Cliff Servetti took the high line just as John Sarale moved high to avoid the stalled cars. Servetti's car climbed Sarale's right rear wheel and shot straight to the wall, causing extensive damage to the Custom Engine Brayton Buick/Stealth. Servetti was uninjured. At the green it was still DeBeaumont's Ed Pink Ford/Stealth in the lead over Johnson's Pink Chevy/Starks, with Robby Flock bringing up third in the Joe Fontana Beast over Carson, Russell and Stratton. Stratton moved by Russell one lap later, setting his sights on Carson. On the 11th round he dropped Carson's Bock Esslinger/Stewart to fifth. The final caution came on the 16th lap when Sleepy Tripp ran into Russell's Guerrini Gaerte/Stealth in the fourth turn, with Tripp spinning as a result. Following the green flag, Stratton worked on Johnson and took over third on the 17th circuit. The positions remained the same over the next six laps. On the 24th lap Stratton caught Flock on the outside down the front stretch, but lost the second position back as they neared the first turn. At this point DeBeaumont was quickly coming upon several lapped cars. Stratton took the high groove, working by Flock, then dove to the pole and charged under DeBeaumont and the lapped cars for the "best move of the race" award! DeBeaumont lost second to Flock on the 26th circuit as he began experiencing handling problems with a broken power steering unit. On the final lap DeBeaumont's problems intensified when the broken power steering bracket affected the fuel pump and he suddenly slowed and coasted across the finish line after loosing eleven positions at the checkered flag. Stratton took the win over a close Flock with Scully bringing up third over Alex Harris, Johnson, Russell, Meseraull, Carson, Floyd Alvis, Sarale, Tripp, Matthew Rossi, Ken Bonnema and DeBeaumont on the leader's lap. Stratton outqualified the 25-car field with the top-ten qualifiers transferring to the main event, inverted. Qualifying heat wins went to Tripp over Servetti and Rodela with Sarale winning the second 10-lapper over Rossi and Bonnema. The BCRA midget head north to the Shasta Speedway in Anderson on June 1 with USAC heading south to the Santa Maria Speedway on that date.